Adolescence and young adulthood is often a difficult enough time without serious illness. However, research has shown that cancer, and surviving cancer, at this age presents distinctive problems medically, socially and psychologically. 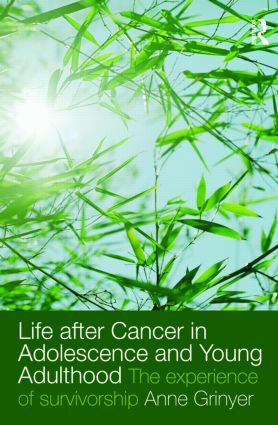 This important work offers a glimpse into a previously under-researched area and contributes to a better understanding of the needs of young adults post cancer. Focusing not only on the physical effects, but also the social, cognitive, emotional and physiological consequences of surviving cancer in young adulthood, Anne Grinyer draws directly upon data collected from young adults who have been treated for cancer. The book is structured around themes they raised such as fertility; life plans; identity; psychological effects and physical effects. These issues are drawn together in the final chapter and related to clinical and professional practice as well as current policy. This book presents the voices of those who have lived through the experience of cancer in young adulthood, and links them to the theoretical and analytical literature. It will be of interest to professionals and researchers in nursing, social work, counselling and medicine as well as medical sociologists, young adults living with cancer and survivors of young adult cancer.